Pilgrimage plays an important part in Jain life as the lay Jain followers embrace the austere lifestyle and attitude of a Jain ascetic (a monk or nun). Also, this Jain Pilgrimage Tour takes a pilgrim through most of the sacred shrines and holy temples revered under the faith. The highlights of this tour include sacred Jain temples at Dilwara, Ranakpur, Pawapuri and Sravanabelgola that surely will inspire a pilgrim to recapitulate the religion's journey through many states in India. After breakfast, check out the hotel and transfer to the Delhi airport to board flight for Udaipur (2 Hrs flight). On arrival here, transfer to Mount Abu by road (190 Km / 4 hrs). An oasis in the desert, this is the mountainous retreat famous for the scintillating Dilwara Temples. Upon arrival here, check in the hotel for overnight stay. After breakfast full day sightseeing Mount Abu Hill station including the visit to the famous marble Jain temples at Dilwara. Built by Jain merchants of West India, these temples demonstrate their ardent devotion towards their faith that resulted in such scintillating temples here. Return to Mount Abu for overnight. After breakfast, check out Mount Abu and drive to Ranakpur (185 Km / 4 hrs). On arrival here, check into the hotel. 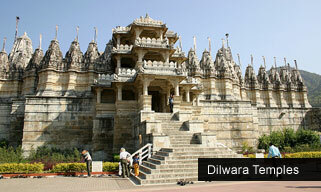 In the noon time, visit the famous Jain Temples of Ranakpur. Overnight at Ranakpur. After breakfast, check out Ranakpur for a drive to Udaipur (90 Km / 2 hrs). This is the luxury capital of India and one of the most inviting attractions of the country. On arrival here, check into the hotel. In the afternoon, begin the sightseeing of this beautiful lake city followed by boating at Lake Pichola. Overnight at Udaipur. After breakfast transfer to the airport to board flight for Delhi. On arrival, transfer to the hotel. In the afternoon, begin the sightseeing of Delhi, the capital of India. Overnight at Delhi. In the morning, check out Delhi for scheduled transfer to airport and board the connecting flight for Patna, the gateway city for Pawapuri. This is one of the most prominent Jain pilgrimage site known as the cremation site of Lord Mahavira. 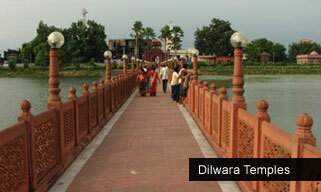 Located 101 km from Patna, this town during the times of Mahavira was as 'Apapuri', meant devoid of sins. Upon arrival here in Patna, check in the hotel and begin the sacred visit to Jal Mandir here. This is also addressed as the Nirvana site of Lord Mahavira. Shaped in the form of Vimana, this marble temple is located in the middle of the lake. The temple's sanctum also enshrines an old "Charan Paduka" of Lord Mahavira. The temple marks the space where Lord Mahavira attained Samadhi and was cremated later. The temple is believed to be constructed by King Nandivardhan, the elder brother of Lord Mahavira. Return to Patna for overnight stay. Day 8. Patna – Bangalore. Check out Patna to board the flight for Bangalore. Upon arrival here, check in the hotel for overnight stay. After breakfast, check out Bangalore and transfer to Hassan (139 Km/ 4 hrs). Hassan is the heritage gateway of Karnataka and is also the base to visit one of the prominent Jain heritage shrines, Sravanabelgola. Overnight at Hassan. Morning after breakfast, begin a full day excursion to one of the most important Jain pilgrimage center Shravanbelagola. This is known for the colossal monolith statue of Gommateshvara Bahubali, a Jain Arihant. The site is prominent for the Mahamastakabhisheka. Held once in every 12 years, this is a spectacular ceremony wherein the colossal statue is covered with milk, curd, ghee, saffron, etc. The next Mahamastakabhisheka will be held in 2018. Return to Hassan for overnight. After breakfast, transfer to Bangalore. On arrival here, in time transfer to the airport to board the connecting flight for onward journey.